Gouren or Breton wrestling has very ancient origins which can be traced through texts, engravings, sculptures and statues in different Celtic countries. Introduced to Brittany by our ancestors at the time of their migration, it was very popular during the Middle Ages and the 16th century. In 1455, when the Duke of Brittany, Pierre II, went to visit the king of France at Bourges, he was accompanied by a group of renowned wrestlers : Olivier of Rostrenen, Guion of Kerguivis, Olivier of Kenec'hriou, etc..
Nowadays, there are six weight categories in Gouren for seniors (feather, light, middle, middle-heavy, heavy and super heavy) and there are also age categories for the young. There are about a thousand members in forty clubs in the five Breton counties and the Breton clubs in Paris and just recently been brought to the US by Matthew Nichols, who is the only certified coach in the US. Gouren is performed on sawdust in summer and mats in winter. The wrestler wears shorts and a strong linen shirt. The object is to throw your opponant on both shoulders at the same time. This is call a "lamm" and it ends the combat. 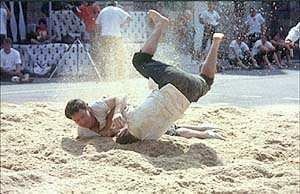 Each time an attack results in a near "lamm" a point is given, but contrary to Graeco-Roman wrestling, the combat doesn't continue on the ground. 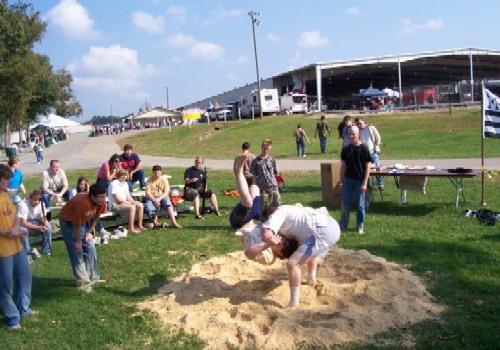 Breton wrestling is played standing up. It is important to note also that each bout is preceded by an oath of loyalty, the players shake hands before the fight. Formerly, a game played at the "Pardons", Gouren is today becoming a game played by athletes in clubs, and this follows the general evolution of sport at the moment. If the quality and technique of the game have gained a lot, the passion that animated the spectators of two neighbouring, rival parishes cheering their respective champions is tending to disappear.